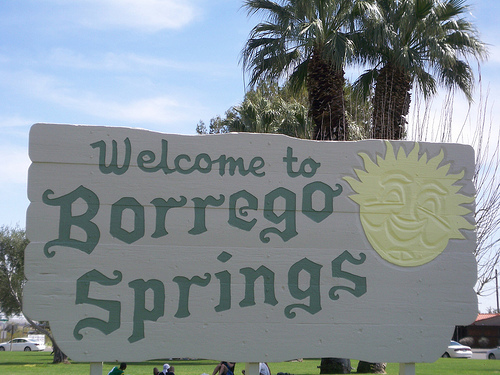 Borrego Springs offers one of the most diverse and exciting vacation getaways in the entire country for individual travelers and families. Among the amazing attractions available in Borrego Springs is the Anza-Borrego Desert State Park, which spans hundreds of thousands of acres and surrounds the small city. The park offers amazing views of wildlife and nature as well as miles of trails, canyons and rolling hills you won't find many other places on earth. Deserts are harsh and often people do not realize the incredible amount of life that exists there. Rare and interesting flowers, plants and creatures both big and small populate the Anza-Borrego Desert giving visitors an opportunity for a very unique experience. The Anza-Borrego Desert State Park features a wide array of vibrant wildflowers and rare plants. While sometimes deserts can seem void of colors, these wildflowers provide a vibrant display of rare colors that are in full bloom come springtime. This gives visitors a wonderful opportunity to take a hike through the canyons or trails to see these flowers on full display. It is a perfect adventure with a chance to take dozens or even hundreds of pictures capturing sights you are likely to rarely see ever again. Visitors may be surprised to see the vast array of colors the flowers and vegetation of the Anza-Borrego provides. When they are in full bloom it is common for a large portion of the desert to be covered in various shades of purples, yellows and reds. One hike or trip through the desert won't be nearly enough to capture all the beauty on display. Below is a list of just a few of the species of flowers you are likely to find the Anza-Borrego. Various types of wildlife populate the Anza-Borrego Desert State Park and provide amazing sights for visitors who may have never seen some of the creatures that call the State Park home. The wide variety of wildlife provides exciting and rare views into the world of nature at its best in a completely natural environment untainted by the modern world, just as it was several hundred years ago. These sheep are most recognized for their large curled horns and are often at the top of the priority list for creatures visitors most want to see. They populate several areas of the Desert and are most common in the northern area of the Santa Rosa Mountains. Mule Deer are very common in the Anza-Borrego Desert area and are normally found in the higher elevations as they feed on various types of vegetation. There are several predators that prey on the mule deer such as Bobcats and Mountain Lions. The Kit Fox is a small creature about the size of a normal house cat and most of their active time is at night. Their daytime hours are spent in dens underneath the ground. Bobcats roam freely around the desert area and stay mostly in the foothills or mountainous areas. They prey on other large and small creatures found in the desert and are perhaps the most feared predator along with mountain lions. Mountain lions rule the Anza-Borrego desert and prey on other creatures in the area. They are most often found near the mountainous areas and although they avoid contact with humans, visitors should always be careful to stay a great distance away from these beautiful but dangerous animals. Because there is so much to discover about the Anza-Borrego there are many different activities available that uncover the many amazing things to see and do. Adventuring on your own can be fun, especially if you are experienced and have done your research. However, it is well worth it to explore the different tours and guided hikes available, as they will expose many things about desert life you will not find on your own. California Overland Tours is highly experienced and has been giving tours of the Anza-Borrego since 2005. They offer perhaps the widest range of tours with both group and private excursions available. Their tours range from just a couple of hours to a full eight hours or even overnight packages as well. They also have specialty tours such as their Julian Wine Tour and Desert Wildflower Tour. Their overnight adventures include not only fascinating information and live desert wildlife experiences but also a professional astronomer that uncovers the mysteries of the Anza-Borrego night sky. No matter what tour package you choose, you are sure to have a fascinating experience full of surprises. Borrego Jeep Photo Tours offers private and group tours in different areas of the desert with a focus on photography. Instruction from a professional photographer is included in the cost and appears to be a focal point for those interested in capturing amazing wildlife moments in the desert and the night sky. The tours range from two to six hours and can be customized upon request. These tours offer a detailed astronomy experience of the night desert sky with a professional astronomer. The tours typically last three hours and must be reserved in advance as there are limited spaces available. If you are looking for a tour that is focused primarily on the astronomy aspects of the Anza-Borrego night sky, this is an excellent choice. The ABDNHA holds a wide variety of events that celebrate the magnificence of the Anza-Borrego. Hikes, bird walks and the Rock and Gem Club meetings are just a few of the regular activities they sponsor. Between October and May each year they hold 100-200 sponsored events that highlight a wide range of exciting aspects of desert wildlife and its surroundings. There are several routes available that you can drive in your own vehicle that can serve as self-guided tours. While they do not compare in detail or experience to the guided tours mentioned above, they can offer a wonderful overview of the beauty the Anza-Borrego has to offer. The Erosion Road Tour takes approximately one hour to drive eighteen miles and offers spectacular views of the Santa Rosa Mountains, Font's Point and many other well-known areas of the desert. The Metal Art Sculptures Tour features over one hundred metal sculptures created by California artist Ricardo Breceda. Most of the sculptures depict animals of the desert and prehistoric wildlife. This tour is a bit unconventional, but it will give you an experience you won't find anywhere else in the entire world. Most of the roads are paved and the entire tour is just over twenty miles, so it is worth a couple of hours just to see the unique works of art. While the self-guided tours are no replacement for the guided professional tours, there is something about each type that offers its own unique experience. If you have time, it is recommended to try several types of tours and see what mysteries you uncover about the Anza-Borrego Desert. The Anza-Borrego offers incredible sights of nature and wildlife you will rarely see in one place. There are various ways to enjoy the park offering something for everyone depending on your individual preferences or needs. 4 wheel-drive vehicles are available for rent, organized hikes, desert tours and guided walks through various canyons all are available for visitors who are interested in seeing all the magnificent wonders of the park. In addition to park activities during the day there are also nighttime tours available. Some of which, focus on showing visitors the magnificent view of the night desert sky and incredible stars on display. If you happen to visit the area at certain times of the year, you might get lucky enough to experience a meteor shower or other amazing events of the Anza-Borrego Desert sky. Come explore and experience the Anza-Borrego and see the wonders of nature and all the fantastic wildlife available with your very own eyes!